Sorry to all my faithful readers for my absence recently. I started a new job at a new firm, so my blogging has moved down the priority list but only temporarily. I am still committed to documenting my thoughts, especially finance and R thoughts as discussed in Why Talk My Book? . So far, I have used R primarily for my own use without the intention of sharing with clients <> R stats finance geeks. However, R is so powerful that I would like to leverage it for more general communication. Our shop uses Advent Axys, which I believe is still the industry standard despite its extremely poor and inflexible reporting capabilities. At one point in a previous life, I believed some of the inflexibility could be overcome through its replang scripting, and I endured a very painful journey documenting and experimenting http://www.axysreporting.com. I now believe the best solution is to use Axys only to export its information to better, more capable reporting engines. In this example, I amended the Axys 631 report to export performance to a .csv file. I'm concerned that sharing my amended report might violate the very aggressive IP attorneys at Advent. I will try to write from scratch at some point to share while still avoiding this ire. Please let me know if you have already done this to save me some time and effort. Click on the screenshot to get the .csv file from Google Docs. For now, I will share a sample performance file generated from my 631 exporter, and change the fine PerformanceAnalytics charts.PerformanceSummary report. In later posts I will add some ggplot2 charts. I think the chart is now good enough to share with clients, but unfortunately, my code is nowhere near as clean or robust as I would like. I combined all the code into one R script, and here is the result. I would love input and thoughts. 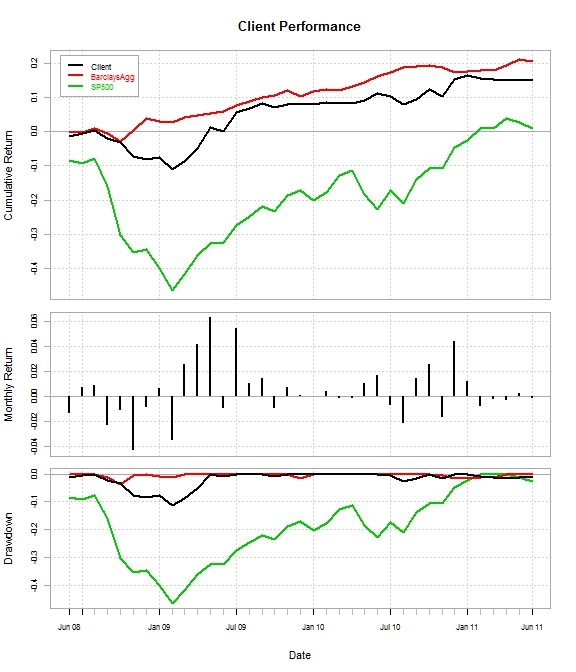 The original charts.PerformanceSummary with no modifications. na.skip <- function (x, FUN=NULL, ...) # maybe add a trim capability? # you still need to keep track of the structure of the oridginal data. # a cumulative return or a "wealth index". # legend.loc: use this to locate the legend, e.g., "topright"
# and underwater chart for drawdown. # R: a matrix, data frame, or timeSeries, usually a set of monthly returns. #   columns are assumed to be relevant benchmarks for comparison. #   periodicity as the data being passed in. I prefer this over the standard PerformanceSummary , very nice. I've just updated my TAA code to use this and really like the Annualized Return bar chart. Nice reports. A couple years ago I built and fielded a commercial system to handle client performance reporting out of Advent, so I can sympathize with your replang thoughts. I use R more like your blog posts, to analyze strategies, but have recently been thinking about how nicely it handles a lot of the reporting stuff I built custom and removes some of the uglier pieces (helloooo reportlab, I'm lookin' at you). some interesting stuff now coming out of http://axysreporting.com. You might want to check it out. oh very nice. 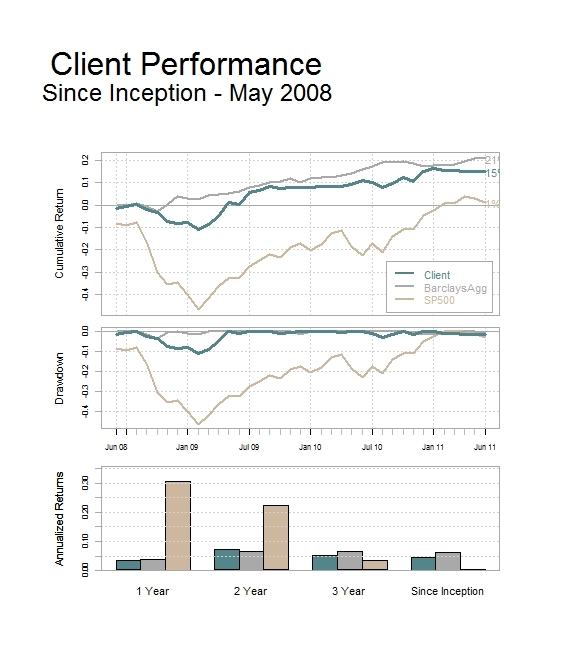 I have had much better luck with latticeExtra and xtsExtra for making slightly prettier PerformanceAnalytics charts. ggplot2 is amazing but I just can't ever get my mind to match up with the framework.